May 2, 2012 – Defensive End Derrick McKee from Southern Lab High School, who stands 6-6 and weighs 215 pounds, recently signed with Mississippi Gulf Coast Junior College and will play two years. I predict he will come out in two years as a highly recruited Defensive End. He will be in the 255 to 260 range in two years. Right now Derrick can run a 4.65/40 and was a big time pass rusher in High School. QB Nik McCarty (6-3, 185) and WR Cody Bordelon (5-10, 175), who are both from Calvary Baptist High School in Shreveport, are leaning to sign with Arkansas Monticello for football and possibly Baseball. RB Trey Gilbert from Winnfield High School has decided to play football for Holmes Junior College in Mississippi. Trey is a powerful 5-8, 195 pound running back with power between the tackles and quickness to burst outside for long gains. I filmed this kid in 2011, and I loved watching him play the game with passion and high effort. Trey could be a big time DI player in two years. RB Dylan Ledet (5-10, 225) from E.D. White High School signed with Cornell for football in 2011, but has since left Cornell and is leaning to enroll at LSU for school and football. Dylan runs a 4.6/40, benches over 400 pounds in the weight room, and squats over 600 pounds. If this kid decides on LSU it would be a big time steal for the Tigers to get a Fullback of his caliber. I had a chance to visit North Desoto High School and Mansfield High School, and I met with North Desoto Head Coach Scott Abernathy. Both schools are located right outside Shreveport and are within a few miles of one another. I’m super impressed with the facilities at Mansfield, and the new turf football field at North Desoto is big time. The weight room is as good as any I’ve seen in Louisiana. Mansfield has a new Athletic Director in former LSU football star Tight End Chris Hill, who still looks like he could play in the NFL right now at six foot five. It was good seeing these coaches and seeing the future of these programs that are on the rise in North Louisiana. Southwood High School also has an updated weight room, and it looks night and day from the last few years for the program. I was very impressed with the future of the facilities at Southwood. Head Coach Anthony McClain does a great job with his players wherever he goes to coach building structure with the kids with a game plan and a system that works. I watched Evangel Christian High School in summer work outs running, and they are super fast again and have size too. Coach Byron Dawson, one of the best defensive line coaches in Louisiana, leads his team to some intense work outs in the morning. You can tell why these kids are ready late in games from the few years he’s been the head guy in the off season program. I was able to go by Calvary Baptist High School, and it was a joy to talk football with Ronnie Alexander, one of the best Defensive Coordinators in Louisiana over the last 25 years in High School football. I also spent time with Johnny Booty who is a big reason Calvary Baptist has been able to grow so fast in facilities to match anyone across the board in all sports programs. I was also able to see one of the hardest working people you will ever meet in Coach Clint Hortman who does about everything needed in all sports at Calvary Baptist High School. Friday I will have News & Notes from my Alexandria, Louisiana, Football Trip. 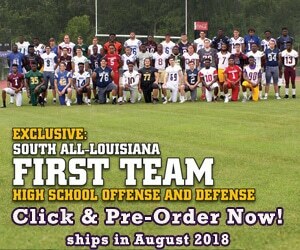 For more on these schools and the rest of the schools in the state, pre-order the 2012 Louisiana Football Magazine Preview Issue at www.lafootballmagazine.com/store.